Wolverine World Wide, Inc. WWW is scheduled to report fourth-quarter 2018 numbers on Feb 20, before the opening bell. We note that the company surpassed the Zacks Consensus Estimate in three of the trailing four quarters, the average beat being 16.5%. In the last reported quarter, the company delivered a positive earnings surprise of 10.7%. Let’s see what’s in store for the company this time around. The Zacks Consensus Estimate for fourth-quarter earnings is pegged at 49 cents, reflecting an increase of 19.5% from 41 cents per share registered in the year-ago quarter. Notably, the consensus mark has remained stable over the past 30 days. For revenues, the consensus estimate stands at $580 million compared with $578.6 million reported in the year-ago period. The Zacks Consensus Estimate for revenues of Outdoor & Lifestyle Group and Boston Group is pegged at $243 million and $236 million, reflecting an increase of 3.4% and 11.3%, respectively, from the prior-year period. However, the same for Heritage Group stands at $89 million, down 10.1% year over year. Wolverine boasts a wide portfolio of owned and licensed brands of casual as well as athletic footwear and apparel. We note that two of the company’s biggest brands namely Merrell and Wolverine have been gaining traction lately. Further, the company plans to strengthen its brand portfolio through innovation and expansion of its brands to newer geographies and platforms. Moreover, this designer, manufacturer and retailer of footwear, apparel and accessories is riding well on its solid international presence. In fact, the company plans to add strategic resources to strengthen its regional teams, especially in the emerging regions of Asia-Pacific such as China. Such efforts are likely to help achieve revenue growth from its international business. Apart from these, the company’s endeavors toward developing e-commerce are commendable. Efforts in this respect include enhancing social presence, better digital advertisement maneuvers, and effective implementation and management of consumer database. Further, the company has allocated approximately $15 million of incremental investments toward digital advancements. Also, Wolverine is on track with its GLOBAL GROWTH AGENDA, which aims at driving growth and profitability amid a competitive market scenario. Our proven model does not conclusively show that Wolverine is likely to beat estimates this quarter. This is because a stock needs to have both — a Zacks Rank #1 (Strong Buy), 2 (Buy) or 3 (Hold) and a positive Earnings ESP — for this to happen. You can uncover the best stocks to buy or sell before they’re reported with our Earnings ESP Filter. Though Wolverine has a Zacks Rank #2, its Earnings ESP of 0.00% makes surprise prediction difficult. You can see the complete list of today’s Zacks #1 Rank stocks here. Foot Locker, Inc. FL has an Earnings ESP of +2.78% and a Zacks Rank #2. Steven Madden, Ltd. SHOO has an Earnings ESP of +3.09% and a Zacks Rank #2. NIKE, Inc. NKE has an Earnings ESP of +8.37% and a Zacks Rank #3. 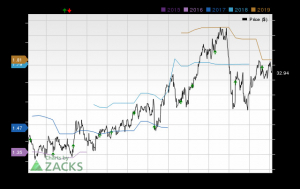 Steven Madden (SHOO) Up 3.1% Since Last Earnings Report: Can It Continue?